Hell’s Kitchen neighbors bonding at the first Swap, Share and Shmooze (Credit: Enid Farber). 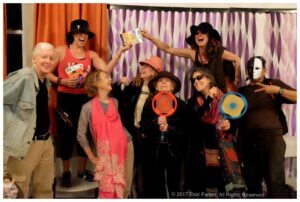 From doggie toothpaste and Gucci boots to cast-iron pans, feather boas, bicycle helmets and lots of other quirky, useful items, our second Swap, Share and Shmooze in Hell’s Kitchen was a huge success. And not just for material things. We shared laughs, stories, ideas, friends, business cards, recipes, and houseplants. Most importantly, we shared a sense of community, no small feat in our quickly changing neighborhood. As the youngest of three girls, when I was a kid, the mere mention of hand-me-downs had my eyes rolling. I never got a new Barbie. And, with sisters 13 months apart, who often dressed as twins, I’d inherit two of each outfit. 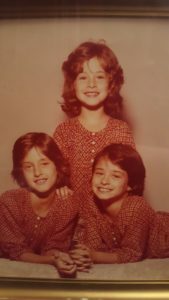 Sometimes we all dressed alike, which meant as soon as I outgrew my red silk 70’s shirt, I got two more. “Why bother to buy new things when these are perfectly good?” I couldn’t really argue. I knew I couldn’t win. Chana often inherited a double set of hand-me-downs from her two older sisters. As the child of a Holocaust Survivor, I lived in a home where purpose and function were found in everything. Our house was full of rescued glass jars for storing things, colorful “disposable” utensils that were washed and never thrown away, Legos and wooden blocks passed down through generations, and memorable bed sheets with hippos and Peanuts characters used for years by my cousins. I cringed, I frowned, I might have even whined about wanting new things just for me. And here I am now, living in NYC, with eyes that no longer roll. Instead, they open wide like saucers at the first glance of give-away-bags, free-stuff bins, garage sales, thrift shops, and even grocery store discards. We are living in times of immense abundance. Our often-tiny apartments can’t keep up with what we buy and especially what we’re handed down and are tempted to rescue. While inspired partially by my limited budget (I’m a social worker and writer), I am flabbergasted by the sheer irresponsibility of the fashion industry, and particularly “fast fashion”. Did you know that it is the second largest polluter in the world behind the oil industry? I say no to rivers polluted by toxic dyes and to garment workers barely paid a living wage for clothing that won’t even last a year. I invite neighbors and friends to swaps so we can limit our participation in this wasteful consumer industry. It’s much more interesting to hear, “These mahjong tiles were used every Wednesday in the tenements of the Lower East Side by my neighbor’s great aunt” than “I bought them on Amazon.” I love carrying Rebecca’s mom’s vintage purse and I get endless compliments on my wrap skirt with jungle animals. Plus, what would I possibly do without a shiny golden phone receiver to plug into my cell phone? 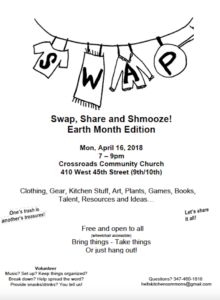 Last Earth Day, We Organized Hell’s Kitchen’s First Swap, Share and Shmooze. Our goal: create a night for our NYC Hell’s Kitchen neighbors to clean out crowded pads, find some awesome gems, make good connections (work? activism? ), socialize, and have a fun night. People left with cashmere sweaters, printers, board games, vintage hats, and a reminder of what can happen when we come together. 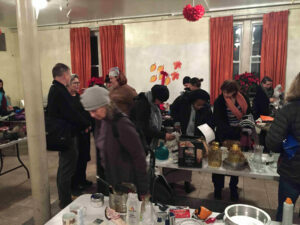 We answered the call for more swapping, sharing and schmoozing and held our 2nd cash-free exchange on January 8, a New Year’s Edition. Young and old, long-time Hell’s Kitchen residents and neighborhood newbies all joined in on the fun. “I don’t understand why we don’t have to pay for these things”, said an enthusiastic elementary school-aged participant while holding up a handful of finger puppets. As luxury high rises replace historic walk-ups, and expensive bars replace affordable groceries, there are now Hell’s Kitchenites who practically throw away diamonds and others who can barely get by. Our Swap, Share and Shmooze events form a powerful bridge, bringing everyone together for the opportunity to give, receive, learn and connect. As volunteers, we have been forging collaborations with neighborhood entities to plan free community events in public spaces for years. We call ourselves Hell’s Kitchen Commons. For the swap, it was exciting that long-time community partner, Crossroads Community Church was happy to share their space. It is full of big round tables, perfect for setting up our neighborhood free store. Then we started to spread the word, using our lists, social media, signs in the neighborhood and word of mouth. We designated each table for specific categories; and in a matter of moments, we had a full free store. We pre-arranged a pick-up by the United War Veterans Council for anything that remained. We’re already cooking up plans for our next free shop in Hell’s Kitchen, April 16, Earth Month edition. We’re looking forward to a fabulous eve of swapping, sharing and schmoozing, Hell’s Kitchen style. Want some advice setting up your own swap event? Leave a comment below — OR GET IN TOUCH VIA OUR FACEBOOK PAGE — and we’ll be happy to help! Want 60 Free Tips on How to Live a Zero Waste Life in NYC? Posting Guidelines – This and other stories published on WeHateToWaste.com are intended to prompt positive conversations about practical solutions for preventing waste. Opinions expressed are solely those of the contributors, and WeHateToWaste implies no endorsement of the products or organizations mentioned. Chana Widawski, a social worker, writer and green-living coach is a four season bicyclist who dreams of a world without disposable plastic water bottles. A believer in story-sharing as a vehicle for healing ourselves and our increasingly toxic world, Chana has organized several story-sharing projects in her Hell’s Kitchen neighborhood and recently “bio-biked” to Washington DC for the 2017 Climate March, sharing her Dad’s story of surviving the Holocaust, what she believes is the source of her“green-ness”, all along her way. Based in New York City, and always ready to travel the globe, Chana is the Families for Safe Streets Organizer for Transportation Alternatives, has led service learning programs across the US and is proud to have spent 13 months in India, Myanmar and the Middle East, refusing bottled water, purifying her own and never getting sick. Chana received her BA in Communication from SUNY Albany and her MSW with a focus in Community Organizing, Planning and Development from Hunter College where she serves as Adjunct Faculty. Chana you rock! Thank you for your story. Thanks Jen. I hope you’ll be able to make it on the 16th! This is a great idea, especially in such a big city with so many people. Our local community has a free clothing exchange with the farmers markets. This would be even better to save on items being thrown in the garbage for no reason. Thanks Marlys. It’s so great to hear about and learn from what’s happening in other local communities! Great story and even greater concept! Every neighborhood in the city should have a swap!! Thanks Dana. I’ll never forget how happy one of our attendees was to inherit your printer! Hope to see you at the next one. It’s Earth Month, so take this opportunity to get rid of clothing, kitchen stuff, art, games … basically anything that’s cluttering up the apartment but that someone else could put to good use. Share it, and help save the planet. And if you don’t have anything to get rid of, come anyway and meet the neighbors. Hello! I had the pleasure of attending both swaps! The first was great, and the second too, just sans wine and snacks:D. Have to remember to bring something for everyone. But I have a question, there was a flyer about a flea market in June at the last event. Do you have any information on this? I love this concept and would love to put together something similar in my college town. We have so many vintage sales but never have swapping events, which has much more of a community feel.